I can’t believe it’s Friday! This week has flown by! Here’s a super simple project for your weekend – maybe you could do it during the big game (if your not into football)! 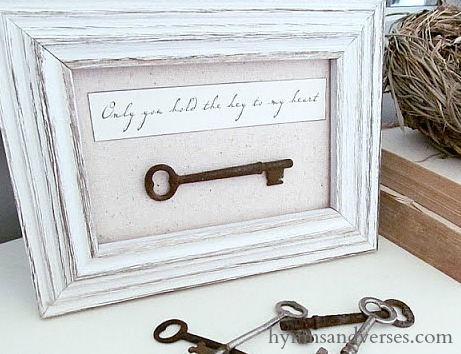 All you need is a simple frame, a piece of scrap fabric, your home printer, and a key to make this sweet piece of art for Valentine’s Day – Only You Hold the Key to My Heart! I have a thing for old skeleton keys. If I find a piece of antique furniture that has the original key, it’s super exciting! A few years ago I was at an antique shop and asked if they had any skeleton keys. After looking around, the owner came back with a brown paper lunch bag with about 20 skeleton keys. I asked how much she wanted for the entire bag – $2!!! That little brown bag was like a pirate’s loot to me! I made this little framed piece for Valentine’s Day, but it could be left out all year. 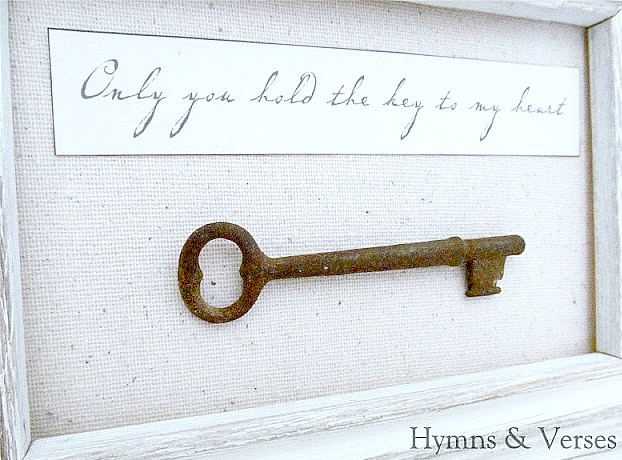 Just a simple framed key with the words – “Only you hold the key to my heart”. Simple – easy – done! 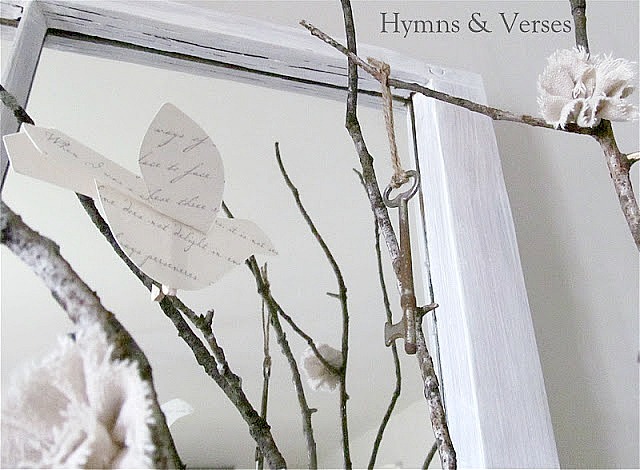 Many of the other keys are hanging from the birch branch arrangement on my mantel. 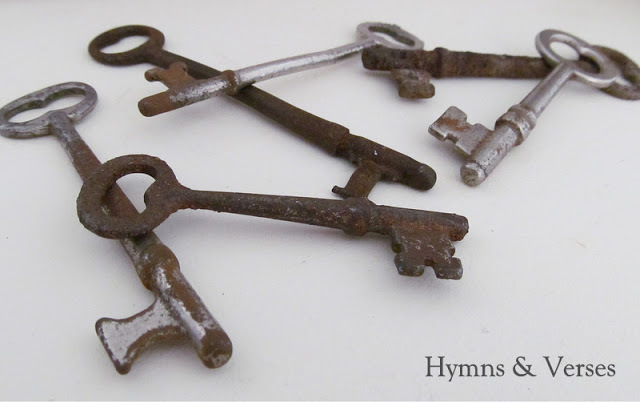 If you don’t have any old rusty skeleton keys, you can always use a decorative key found at your local craft store – I’ve seen skeleton key scrapbook embellishments, jewelry findings, and even some in the dollar bins. I bet you could purchase old skeleton keys on Ebay or Etsy too! Check at garage sales in the spring or at your local antique shops! 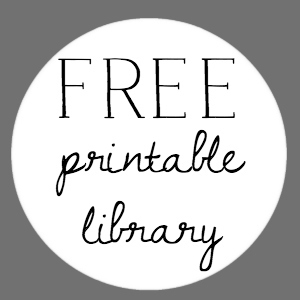 I hope you have fun with this little project! Oh I love old keys too! And you got a real deal on a whole bag – lucky girl. Love the art you created! So Sweet! I adore old skeleton keys. What a great deal on the skeleton keys. Love the idea of framing them. Nice job. Lovely idea. I recently bought a ton of old keys at the Paris flea market. I need to get creative with them! Love Love Love old skeleton keys! And the idea of framing them with an awesome quote is so clever! 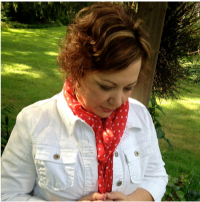 Came to you via Knick of Time Linky and am now a new follower! 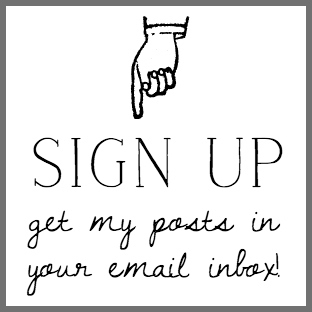 Oh, I'm following you also on Facebook, Twitter, and Pinterest!! How pretty! I love all those keys, and this is just beautiful! Everything is just so beautiful. I love it all. Oh how beautiful!! Love the neutral textures! Thanks so much for sharing at our Monday Funday party! Featured you tonight Doreen at Monday Funday! I wish I got this kind of a present for let’s say a 10years of marriage anniversary, but my hubby would never remember to something so romantic and it practically costs nothing.